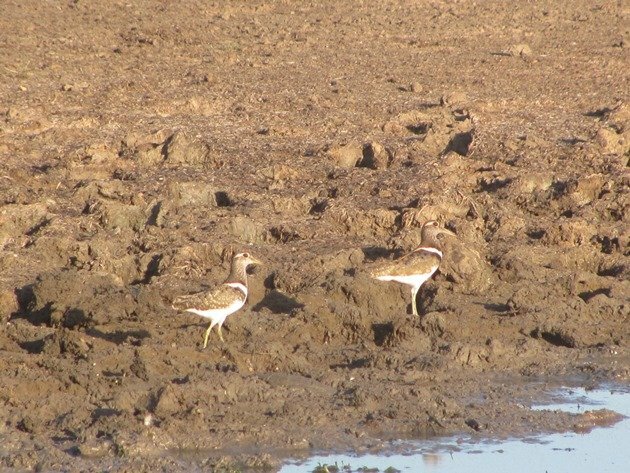 The Australian Painted Snipe–Rostratula australis is one of the hardest shorebirds/waders to find in Australia and very little is known about them at all. In fact we never really expected to observe one around Broome at all and the first encounter could not have come at a better time. 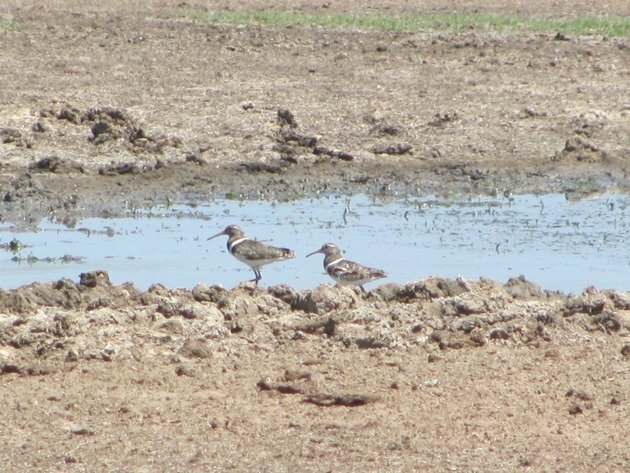 I successfully spotted a pair of Australian Painted Snipe on Grant’s birthday 24th April 2011 and I only mention the date, because that is significant to the situation. April is the end of our Wet Season and if there is going to be a lot of water lying about it will be then. That was a “lifer” for both of us and it was a birthday to remember! The views were distant, but that didn’t matter at all. 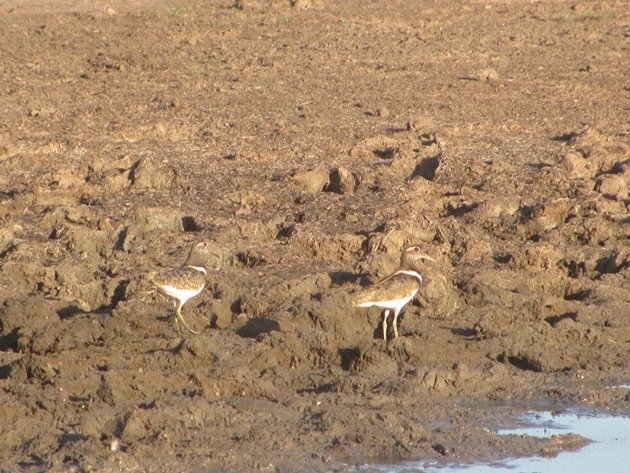 Incredibly we observed another pair of Australian Painted Snipe on 4th August 2013 at an ephemeral lake that still held ample water after the Wet Season, but it could have been the same pair…only they would know that! 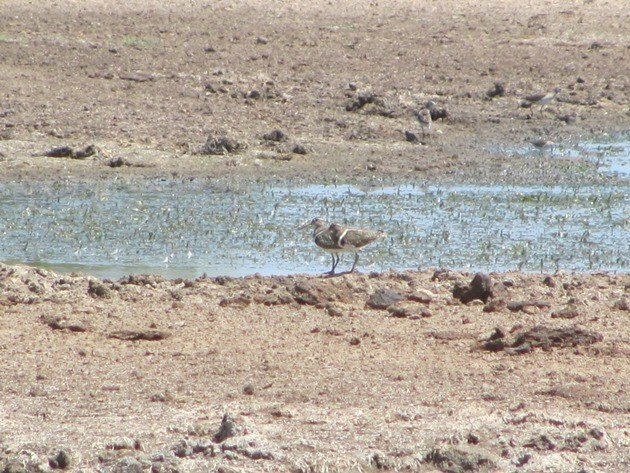 The fact was in both situations the Australian Painted Snipe had arrived when there was plenty of water. 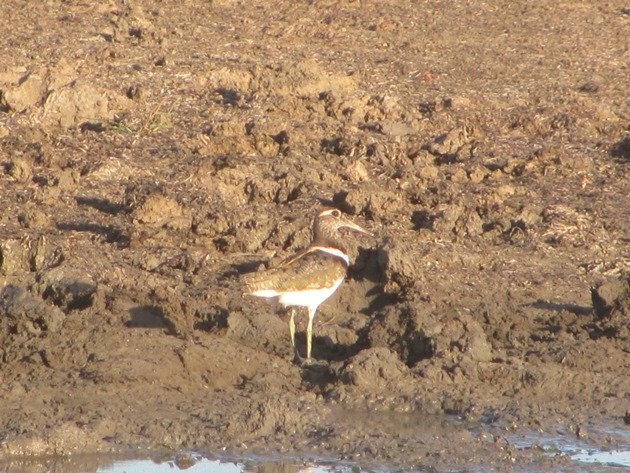 It was therefore a complete surprise that we observed an Australian Painted Snipe on November 10th at an ephemeral lake. 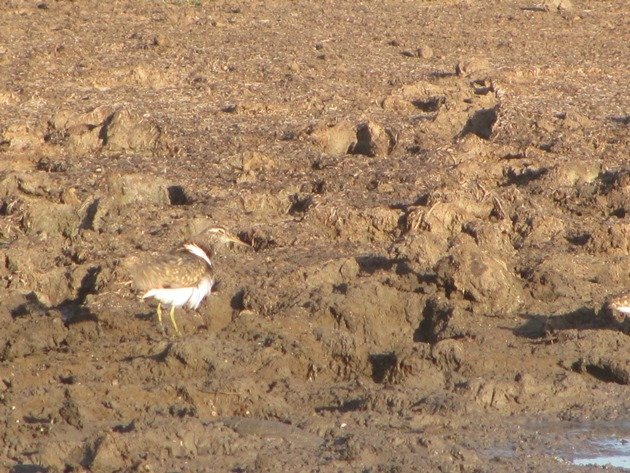 This was hardly a lake any more, but a muddy area containing some water and no doubt ample food for the bird-life around. What had caused this bird to head to this area? Did it expect rain soon or knew there would be enough food until it did come? Had it more knowledge about the weather systems we are to expect? Probably! 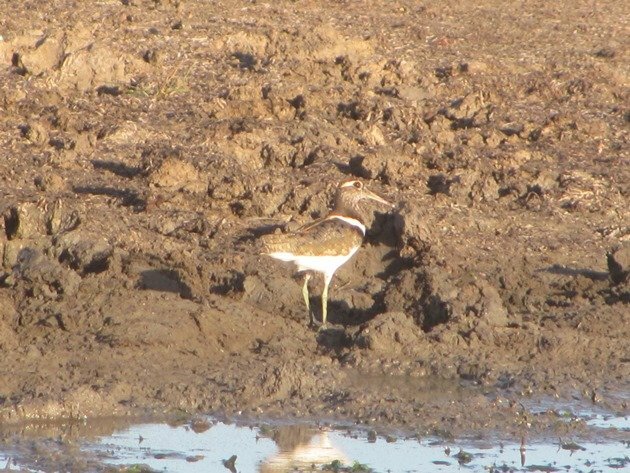 Another Australian Painted Snipe knew something that we did not and had arrived at the muddy area by November 29th, so now there are two! The female bird is generally a lot darker than the male bird and they appear to enjoy each other’s company! We were fortunate enough to watch them wander around the last of the remaining water and then proceed to feed they really are a spectacular bird. 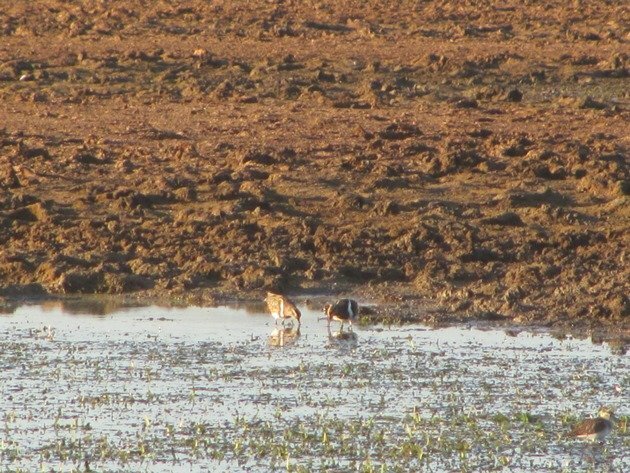 Our luck improved the next day when in early morning light the pair of Australian Painted Snipe wandered around on the mud near us and allowed us to photograph them. If they are sitting the white belly is hidden, but the white “shoulders” can give them away. They do blend into the environment incredibly well. 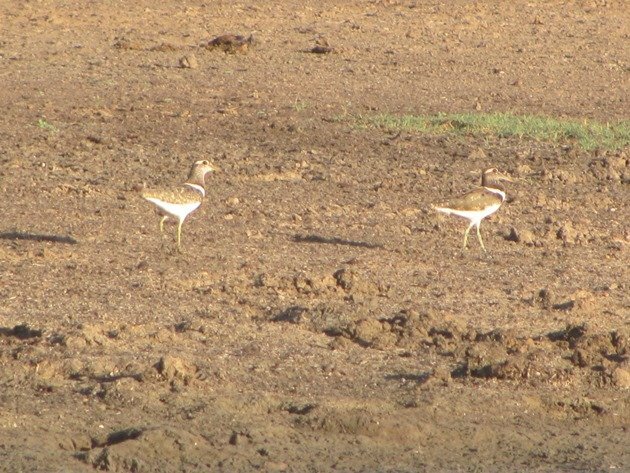 Over the years more and more people have looked for this species, but still very little is known of their movements and when there have been flooding rains in the south of the continent there have been twenty or more Australian Painted Snipe observed at swamps. Where do they go? How do they know where to go? So many questions can be asked of this mystery species. 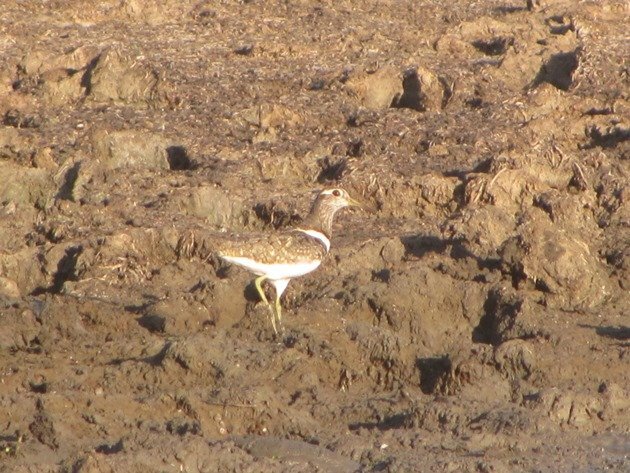 They have very cryptic camouflage and easily hide in the mud. They can drop into dips and keep one of their highly positioned eyes on their surroundings. The Painted Snipe Project was established in 2001 to address the lack of knowledge on the species. It is such a distinct bird you could not mistake it for anything else and I hope that you all one day have a chance to experience your own Australian Painted Snipe! UPDATE:- They did know something….the area has now seen heavy rain and is no longer accessible by four-wheel drive! Wow, I agree, what a fascinating and spectacular bird! I had no idea this bird was such a mystery. I wonder how big (or small) the population is? That is the problem….nobody knows!